Candace Platz and Fynn won the Piaffe Performance Adult Amateur Achievement Award at the Adequan Global Dressage Festival. When watching Grand Prix dressage rider Candace Platz and her 13-year-old gelding Fynn perform, it’s hard to believe that Fynn was born not as a dressage prospect but as the offspring of a PMU mare. Fynn was purchased for just $550 off a trailer as a five-month-old, only minutes before he was to be taken away to slaughter. The draft cross who is registered as an American Warmblood by the US Equestrian Federation was bred in Canada on a PMU farm. He was bound for a kill truck before Adaire Hiestand bought him after seeing his picture online. 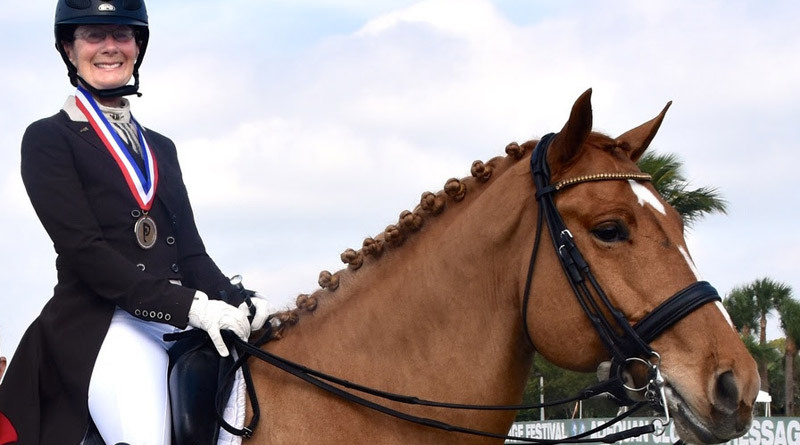 Fynn spent his early years as a children’s camp horse, but as a five-year-old was ridden by dressage rider Karri McFadden, who was impressed with the youngster. Candace Platz and Fynn in action. © Jim Platz. Adult amateur rider Platz bought Fynn as an eight-year-old, and has brought him up the levels ever since. “Fynn is kind of a miraculous guy,” says Platz. The combination was honored at the the Adequan Global Dressage Festival by sponsor Piaffe Performance, an elite dressage facility that enjoys taking time to honor exceptional adult amateur riders who compete at high levels of the sport. After watching Platz and Fynn’s Grand Prix test and learning their story, top international rider and trainer Dr Cesar Parra – owner of Piaffe Performance – presented Platz with the Piaffe Performance Adult Amateur Achievement Award. Parra, an Olympian and US Pan American Games Team Gold Medalist who has also represented the US in the 2014 World Cup, was proud to honor Platz as a fellow equestrian who exemplifies a core value of Piaffe Performance – working hard to achieve dreams. As recipient of the Performance Adult Amateur Achievement Award, Platz won a ribbon, commemorative engraved photo frame, and medallion. Platz was honored to be rewarded for her work with Fynn, whom she described as loyal, reliable, dutiful, and smart. As an older dressage student well aware of kill pens and PMU foals being killed for meat this story makes my heart sing! What a beautiful team they make! Love this story with a happy ending!